Android world has been fragmented, very fragmented. It is android app developers’ worst nightmare, but they have to live with it hoping for things to get better. Every time Google announces it’s sugar coated dessert-ized name for next Android version, app developers become a worried lot. They have to think about how much extra work the new version bring along and more so will the changes required with the new version break their app for the previous versions. While Google is trying to reduce the fragmentation and make it standard (Android Silver? ), the Android ecosystem has already become so large that is difficult to escape millions of varied devices already in circulation. 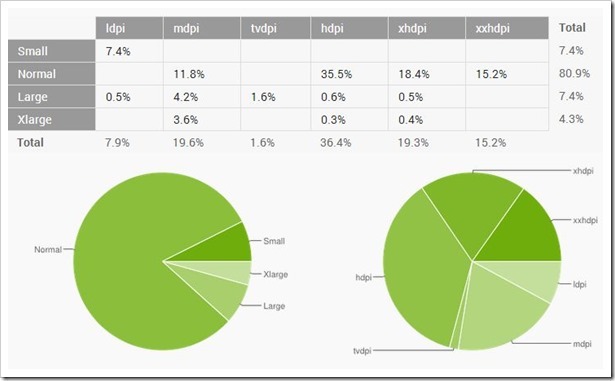 Kitkat, the latest Android 4.4 version now has a healthy market share of 20.9 percent. This means every 5th android handset is now on Kitkat. This version was a major revamp over previous version and it is good that majority of new Android handset that are launched now are on Android 4.4. However, you also need to keep in mind that Android L is already announced and round the corner. Infact, Google has already started releasing Android L images on their developer platform for Nexus 5 and Nexus 7 devices. Jelly Bean, that encompasses 4.1.x, 4.2.x and 4.3 still has over 54 percent market share. Jelly Bean was again a major update that had bought new camera app, new notifications, voice search, Google Now among other features. Even after nearly 2 years of it’s release, app developers still need to give Jelly Bean devices the most importance given the market share it commands. Among the major versions, Ice Cream Sandwich has a low market share of 10.6 percent, while the previous Gingerbread version (2.3.x) has 13.6 percent. Versions prior to Gingerbread have less than 2 percent market and not something that developers should worried about. The Android fragmentation is not just about Android versions, but also about device screens and hardware as every device is different. When it comes to screen sizes and densities, normal screen sized phones with HDPI+ rules the roost. Over 80 percent of all the phones have normal screen size and nearly 71 percent phones have resolutions higher than HDPI.